But neither the Collaborative nor the teachers knew exactly how to capture the impact of this work. With Teacher Champions tailoring their advocacy efforts across 17 states, the fellowship required flexible tools that could be adapted to the varied contexts and approaches. 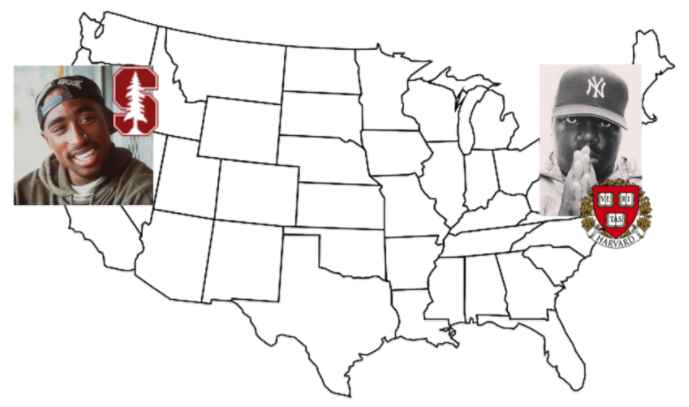 Essentially, they needed an East Coast/West Coast compromise inspired by Tupac and Biggie and anchored by Coffman, Teles, and Schmitt. We also had to acknowledge though, that advocacy work is nonlinear, and advocates must adapt and respond to changing conditions (shoutout to the West Coast). 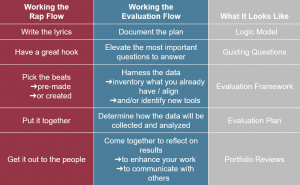 So we left plenty of room for choice and flexibility in the evaluation process. For example, we created common survey tools with core questions for all teachers to use, but also helped Teacher Champions tailor them to their local advocacy initiatives. Because teachers’ voices often go unheard, creating opportunities for them to take control of the evaluation process was doubly important to us. Capturing activity-specific data also helped us embrace the “messiness” of advocacy evaluation instead of being paralyzed by it. In mediating this rivalry, we created our own middle ground for evaluation that empowered teacher advocates, gave them continuous feedback on their results, and allowed us to capture consistent data for the fellowship at the national, big-picture level. Best of all, teachers enjoyed it so much that they began applying evaluation tools, like the logic model, to other work they were doing. While we’re sure we didn’t get it perfectly right, we know this approach worked and have had other advocacy organizations ask us how to structure something similar. When rap came on the scene thirty years ago, the music industry had to carve out a space for it — to create a category for work that shifted the field in significant ways. We experienced the same sort of shift by recognizing that when it comes to advocacy, the middle ground for evaluation — structure and flexibility — was the best path forward. One of the most powerful things about rap is that it provides marginalized people a way of documenting their experiences, and gives them a voice in the public sphere. 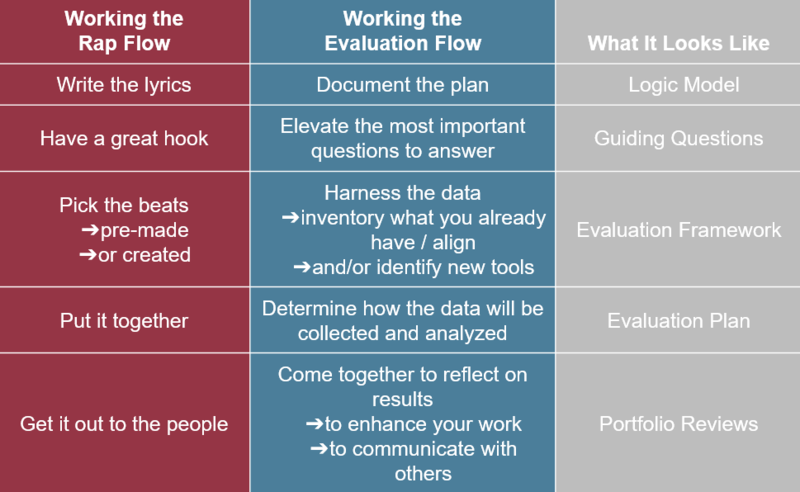 The beautiful thing about evaluation is that it too gives people a way of documenting their experiences, and can potentially create more impactful and meaningful opportunities for them to have a voice in policy conversations. Stay tuned for more posts on evaluating advocacy, the organizations doing similar work, and some best practices. I asked Bellwhether to correct the false statements in this post, and am shocked by the organization’s refusal to do so. Thanks, Mark. Agreed. There never has been a “rivalry” of any sort. I never disputed Steve and Mark’s perspective, which added a great deal to the discussion about how to evaluate advocacy, and has informed my work substantially. I cite their work often (on this topic and others), and hold them and their scholarship in the very highest esteem. Thank you both for inspiring our work. This post is intended to be irreverent, and the tongue-in-cheek metaphor to the rap rivalry was a humorous and effective entry point for introducing the evaluation of advocacy to teachers, who lacked previous experience with research and evaluation. Because your work had the stamps of Harvard and Stanford, and because you had different points of view, this set up the metaphor and it worked to great effect with the group. We take evaluation seriously and we also do our best to make it approachable, enjoyable, and participatory when possible. Thanks for reading our post!